Hello San Jose! 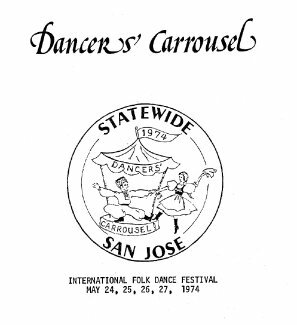 And thank you Dolly Barnes, Federation President North, for your welcome to San Jose's "Dancers' Carrousel," May 24, 25, 26, and 27. 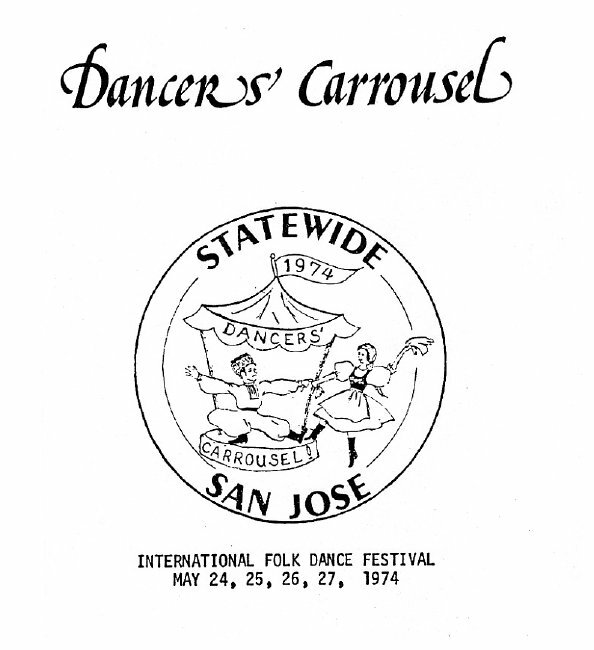 We will be most happy to attend this, the 29th Annual Statewide Festival. We hope you registered early with Jerry and Helen Porter at the headquarters Le Barron Hotel, so you could attend the Opening Party Friday night at the Auditorium. The Auditorium is where all the regular dancing will take place Saturday night and Sunday afternoon and night. The After Parties switch to MCabe's Hall with live music Saturday night. The Institute Saturday afternoon will also be in the Auditorium. During the Saturday night Festival, ten exhibitions will be performed in two groups. Group one will be narrated by Miriam Lidster and group two by Ann Hughes. Sunday night, between 5:00 p.m. and 6:00 p.m., there would be a no-host cocktail party in the Le Barron prior to the Installation Dinner, Chaired by Bee Mitchell with Dolly Barnes as the MC. The two outgoing presidents, Al Dobrinsky and Dolly Barnes, will receive their Past President's pin, the attachment of which they receive at their own risk. Welcome to the ranks Al and Dolly. The Past President's Party had an unusually large attendance and most got in the way of my camera. Too bad I can't show them but they don't copy well. For those who could stay around Monday, the Picnic and dancing at Bramhall Park provided a pleasant end to a fun weekend. Some of those on the Committee not already mentioned but who contributed hours of effort were: General Chairperson, Elmer Riba; Publicity, Polly Burk; Institute, Bill Landstra; Exhibitions, Bee Dresher; Dance Program, Hugh Presnell and Bill Landstra; Statewide Program, Vi Dexheimer; Master of Ceremonies, Jan Wright; Callers, Stan Valentine; Decorations, Jim Rasella; and all the others who contributed. San Jose proved once again they knew how.